Get A.M.P.ed!, Inc. (Athletes Mentoring Program) was founded in 2006 by former college student-athletes, Tesha Nixon-Cunningham and Leon Cunningham. 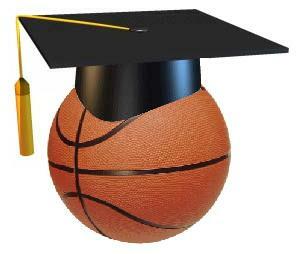 The mission of Get A.M.P.ed!, Inc. is to assist in the preparation of high school student athletes (primarily basketball players) for the college recruitment experience and the college experience as a student-athlete. 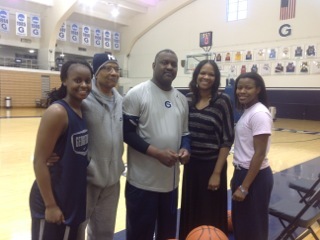 Tesha Nixon-Cunningham visiting her alma mater - Gooooo Hoyas! Leon Cunningham: Leon has been a fixture in the High School Basketball scene in the DMV since 2006. A former student-athlete (basketball) at Archbishop Carroll High School, c/o 1992, Hampton University 1993 and the University of the District of Columbia c/o 1998, Leon curently is an assistant Varsity basketball coach at Central High School. Leon has coached with numerous AAU and High School progams, including DC Blue Devils ,PG All-Stars, Oxon Hill High School and Archbishop Carroll High School. Leon was a coach on the undefeated Freshman team at Archbishop Carroll High School in 2008-2009. Tesha Nixon-Cunningham: Tesha has been considered as one of the best girls basketball coaches in the DMV. She has won the coach of the year award in the WCSAA 3 consecutive seasons. Tesha is currently the head girls basketball coach for Friendship Collegiate Academy. Friendship Collegiate Academy has won 3 consecutive WCSAA championships. Prior to joining Friendship, Tesha was a part of George Mason University's Women Basketball Coaching staff from 2000-2003. Tesha is also a former-student athlete who played high school basketball at Friendly High School and went on to star at Georgetown University. Tesha played professionally with the Philadelphia Rage of the ABL.